The first competition of the DARPA Robotics Challenge (DRC) was a software simulation of humanoid rescue work. The 6 best teams were to be allocated ATLAS robots for the next stage of the challenge, but there’s been an interesting change. Gill Pratt, the DRC program manager, and Nate Koenig, the CTO of OSRF, will be on reddit from 1:00 – 2:00 PM ET today (June 27) to discuss the results of the Virtual Robotics Challenge (VRC) and the future of the DARPA Simulator with the community. In the Virtual Robotics Challenge (VRC), teams competed in a simulated suburban obstacle course. Twenty-six teams from eight countries qualified for the VRC, which ran from June 17-21, 2013. Competing teams applied software of their own design to a simulated robot in an attempt to complete a series of tasks that are prerequisites for the next stages of the grand challenge. In all a total of 7 teams will receive funding and an ATLAS robot to compete in the DRC Trials in December 2013. DARPA is also funding several other “Track A” teams, like CMU, Raytheon and JPL, to construct their own robot and compete in the Trials. In a demonstration of good sportsmanship, Jet Propulsion Laboratory, which also has a DARPA-funded Track A effort with its own robot, decided to merge its two efforts and offer the bulk of the resources it earned in the VRC to other teams. DARPA split the freed resources between the 7th and 8th ranked teams. The robot associated with the JPL win and some funding now goes to TROOPER (Lockheed Martin). As well, additional funds are being allocated to a newly formed team of Team K and Case Western. That team, now known as HKU, will use an ATLAS robot generously donated to it by Hong Kong University to participate in the DRC Trials in December. In total, 7 teams, combining members of the top 9 teams, will move on, with ATLAS robots and DARPA support, to the December round of the DRC, where they will compete with other teams with their own robots. 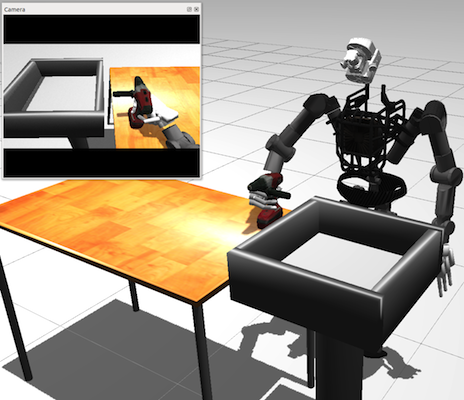 VRC teams were evaluated based on task completion and effective operator control of the robots in five simulated runs for each of three tasks (15 total timed runs) that addressed robot perception, manipulation and locomotion. The tasks included: entering, driving and exiting a utility vehicle; walking across muddy, uneven and rubble-strewn terrain; and attaching a hose connector to a spigot, then turning a nearby valve. To simulate communications limitations in a disaster zone, the VRC imposed a round trip latency of 500 milliseconds on data transmission, and varied the total number of communications bits available in each run, from a high of 900 megabits down to 60 megabits. To conduct the VRC, DARPA funded the Open Source Robotics Foundation to develop a cloud-based simulator that calculates and displays the physical and sensory behaviors of robots in a three- dimensional virtual space, in real time. The simulator allowed teams to send commands and receive data over the Internet to and from a simulated ATLAS robot—information very similar to what would be sent between a physical robot and its operator in the real world. Additional video and images of the simulation and teams’ runs are available at: http://www.youtube.com/DARPAtv and on www.theroboticschallenge.org.